There's been a lot of talk in the beauty community recently about beauty boxes. They seem to be popping up a fair bit now so they're nothing new. I've only experienced Glossybox. I had the last two months prior to this (the one with the HD Brows and the one with the Leighton Denny polish). I think the idea is good in some aspects. You get to try new things, maybe things you'd not heard of before or things that were too expensive to buy in case you didn't like. Though I do think it's sometimes hit and miss. I'd heard today through the grapevine that is Twitter, that people had been demanding refunds for this months Glossybox because there weren't any full size products (excluding the nail wraps). 'Receive 5 luxury product miniatures from high-end brands every month' ... Maybe I'm reading it wrong but it doesn't say anything about full size products there. Though of course, it is nice to open it up and find something full sized. That's not how Glossybox is being marketed. Don't expect something full sized every month, that way you won't be disappointed. I've loved the look of these for a while now but I just don't think I could apply them right. They're like an at home DIY Minx, without the faffing about of a hair dryer. I'm going to keep these for when I next get my nails done and ask the girl that does my nails to pop them on for me! So I'll post about that when I do. I've read so many posts on how amazing this is. Will it live up to the hype? I am eager to see what results this will have on my hair but it claims to be super moisturising and to give bounce and shine. A minty, non greasy cream which hydrates rough, dry skin and soothes, cools and comforts tired feet. Sounds just like what I need after I've been on my feet all day at work. I just tried it and smells lovely and sinks in extremely quickly. I can't usually use foot creams as they are too greasy and have to be rubbed in for ages. I'm that tickilish, I can barely touch my feet so this is definitely a winner. A special blend of all natural ingredients to cleanse the skin and fight off bacteria for a deep, invigorating clean. This feels quite mousse like in texture, I'm used to cream cleansers so that was a bit weird. It's very light though. I'm not a fan of the scent, seems a little old lady like to me but it's left my skin oil free and still feeling hydrated. Hopefully the bacterial fighting properties will help clear up my skin! 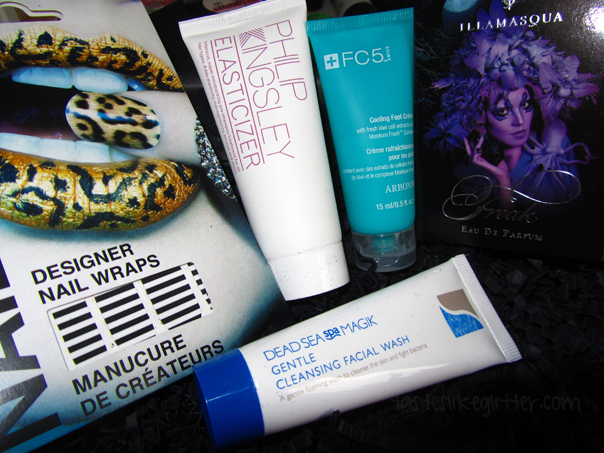 I actually rather like this Glossybox, though I think I might be one of the few that do.